I love octopus! 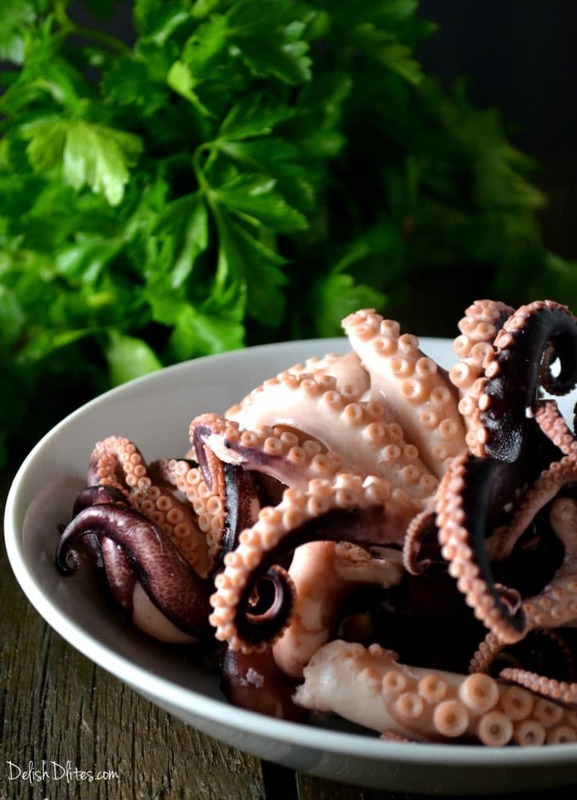 Actually, I love all seafood, but octopus was always a special treat when my dad prepared it, Puerto Rican style. Puerto Ricans enjoy a bounty of seafood thanks to their island location in the Caribbean, and they sure know how make it delish! 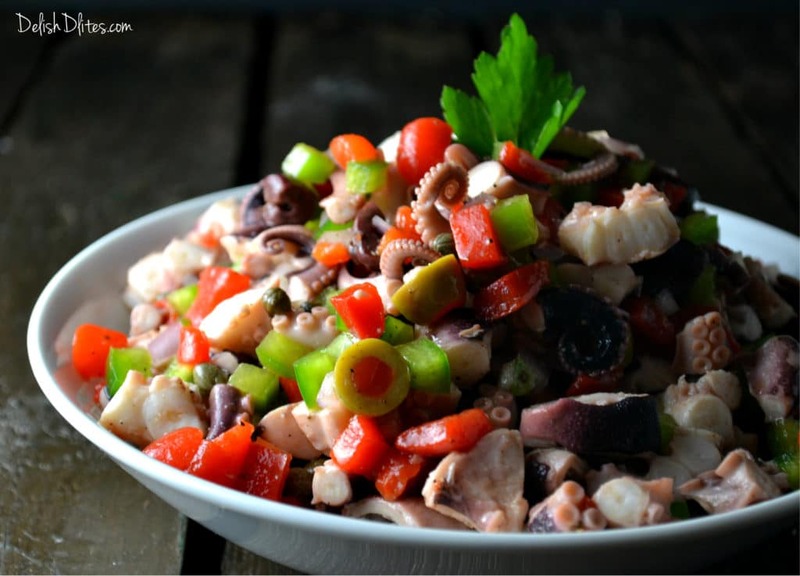 If you’ve never had ensalada de pulpo (octopus salad) before, it’s very similar to calamari in taste and texture. I like using frozen octopus for this recipe, because that usually means it’s already been cleaned. Less weirdness to deal with. 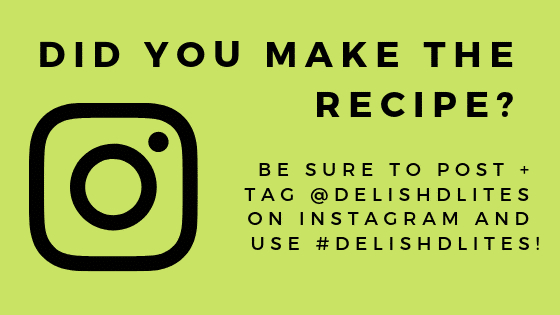 Then, all you have to do is boil it until it’s tender, and you’re ready to put this amazing salad together. 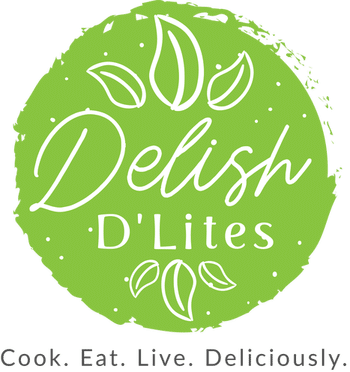 It’s a filling and healthy dish that can be served any time of year! Place the frozen octopus in a large stock pot. Cover with water, and add in the bay leaves, rosemary, garlic, peppercorns, white vinegar and a few generous pinches of salt. Bring the mixture to a boil, and cook the octopus until it’s tender. You can poke the thickest part of it with a knife. If it slides in easily, it’s ready. A large octopus will take about an hour, the baby ones take about 30 minutes. When the octopus is done, remove it from the pan, and allow to cool for a few minutes. You can rinse it off to remove any loose skin and residue. 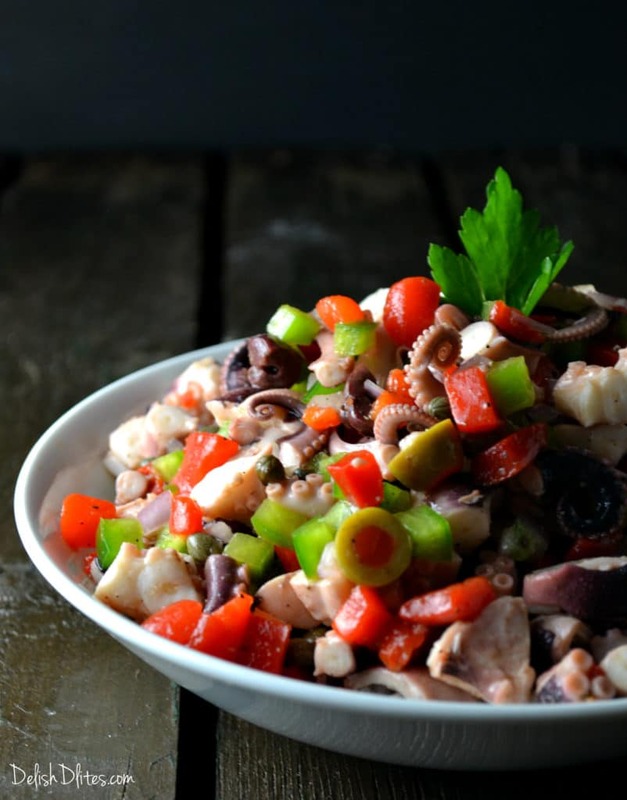 Chop the octopus into chunks, and place in a bowl. Add in the chopped onion, pepper, parsley, olives, capers, lemon zest, red wine vinegar, and olive oil. Stir the mixture together, then season with salt and pepper to taste. Refrigerate for at least 2 hours, so the flavors can marry. Enjoy! 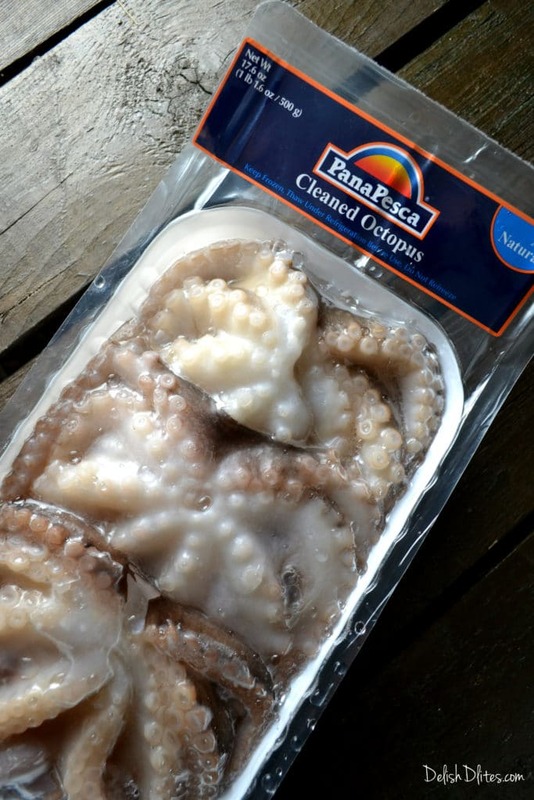 Place the frozen octopus in a large stock pot. Cover with water, and add in the bay leaves, rosemary, garlic, peppercorns, white vinegar and a few pinches of salt. 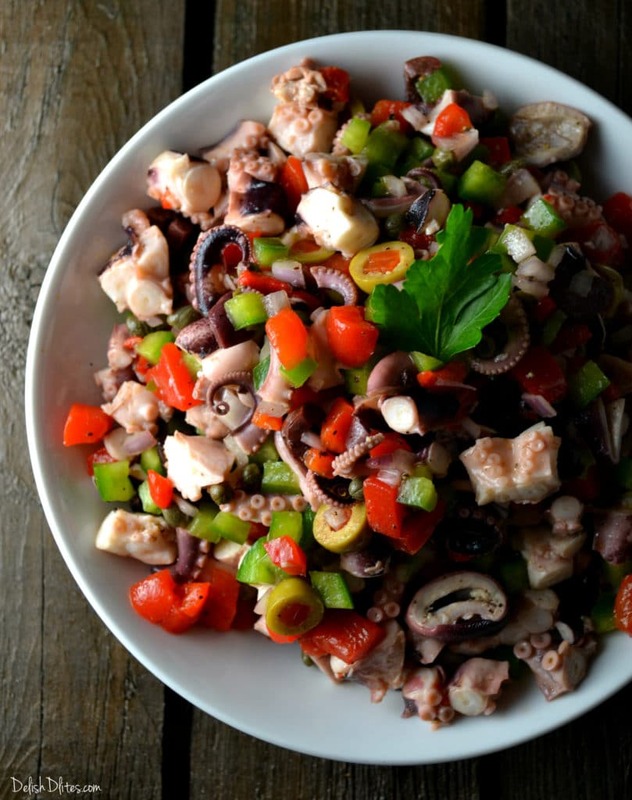 Chop the octopus into chunks, and place in a bowl. Add in the chopped onion, pepper, olives, parsley, olives, lemon zest, red wine vinegar, and olive oil. Stir the mixture together, then season with salt and pepper to taste. Refrigerate for at least 2 hours, so the flavors can marry.